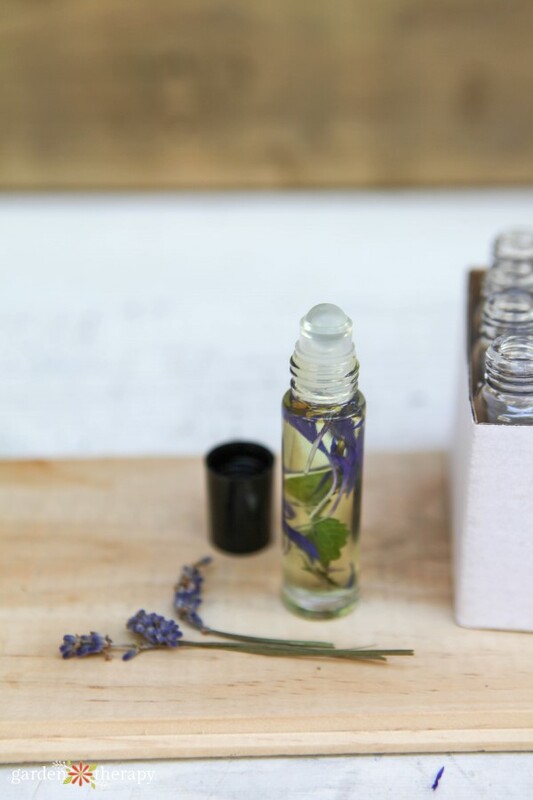 Roller bottles are popular in aromatherapy as a way to apply an individual dose of herbal benefits for a variety of different moods and ailments. 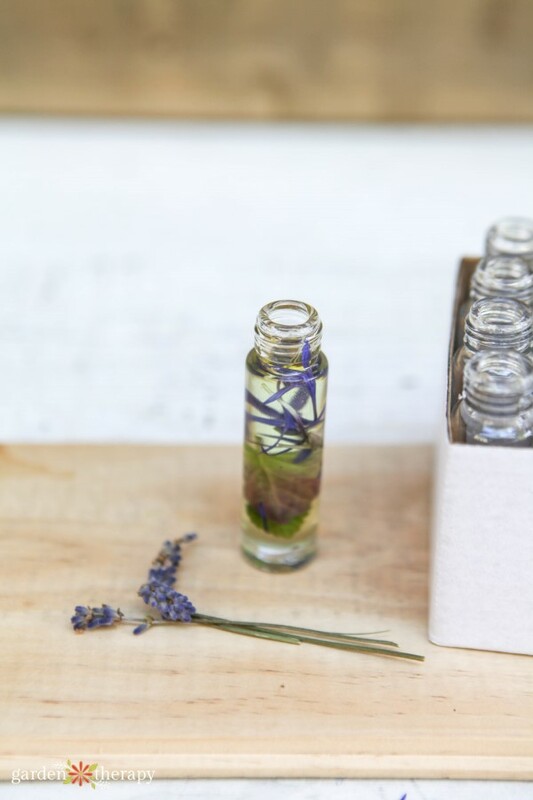 Roller bottles can also make beautiful perfume bottles. 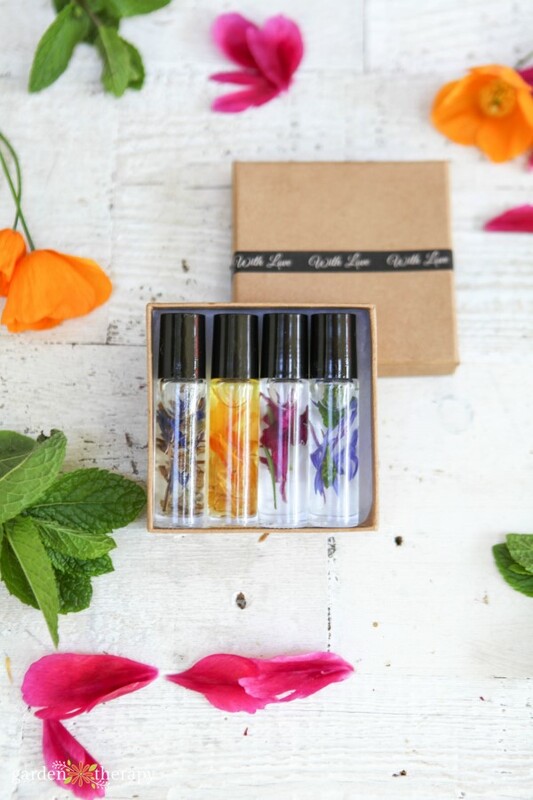 By replacing lab-created fragrances with naturally occurring essential oils you’ll not only smell good but you’ll feel pretty good too. 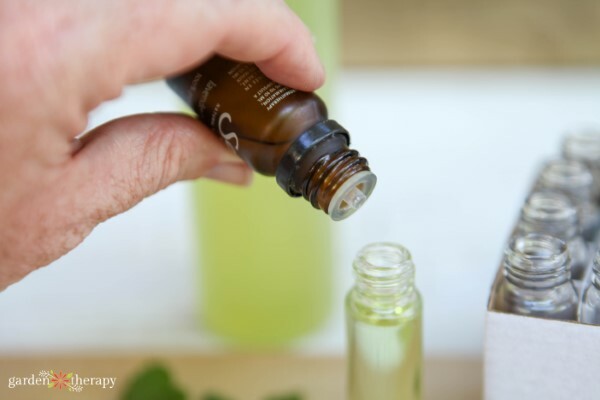 Blending essential oils is a skill that takes practice. To get started, take a few of the scents you are usually drawn to and hold the open bottles to your nose. When you breathe in the combination of fragrances, you’ll learn what you like and what you will want to give a pass. 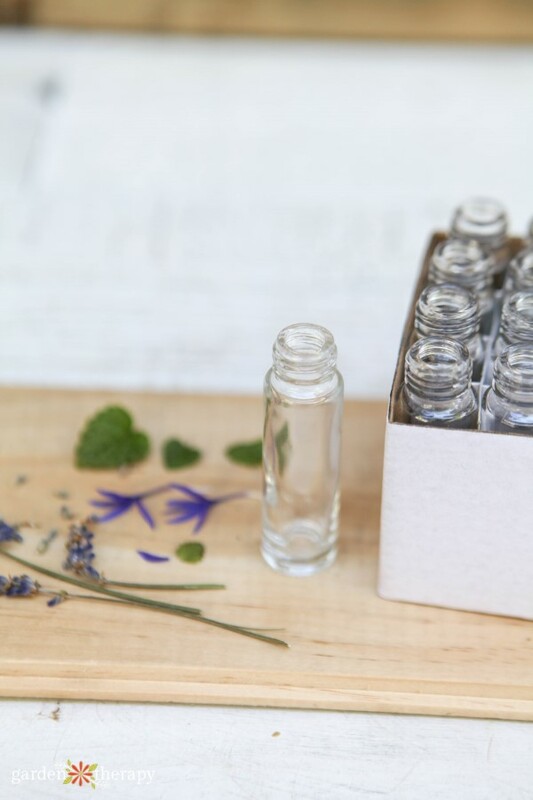 Essential oils’ fragrance characteristics are classified as “notes.”Specifically top notes, middle notes, and base notes. Top notes are light, fresh, fast-acting, and tend to evaporate very fast. This is usually the first scent you smell in a blend. Middle notes help to balance the blend. You might not smell the middle note right away, but the soft fragrance may become apparent after a few minutes. Base notes are very strong and heavy, grounding the blend with their long-lasting diffusion. Balance your perfume creations by blending different notes together to make the end result complex and alluring. Top notes: bergamot, lemongrass, grapefruit, orange, geranium, peppermint, eucalyptus. Middle notes: lavender, rose, mandarin orange, cypress, cinnamon bark. Base notes: patchouli, cedarwood, sandalwood, frankincense, ginger. Carrier oils are oils used to suspend and deliver essential oils. 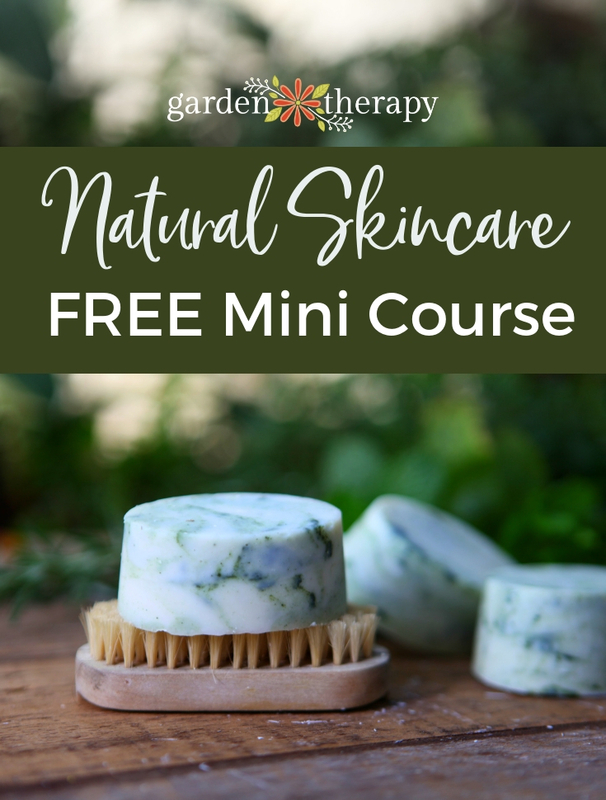 They are the base that you add essential oils into so that they are properly diluted before applying to your skin. Good choices for carrier oils are thin oils without a strong fragrance. Choose fractionated coconut oil, grapeseed oil, sweet almond oil, or jojoba oil to make aromatherapy perfume. Unfortunately, not all of the flowers that are beautiful in the garden hold their color well when they are submerged in oil. 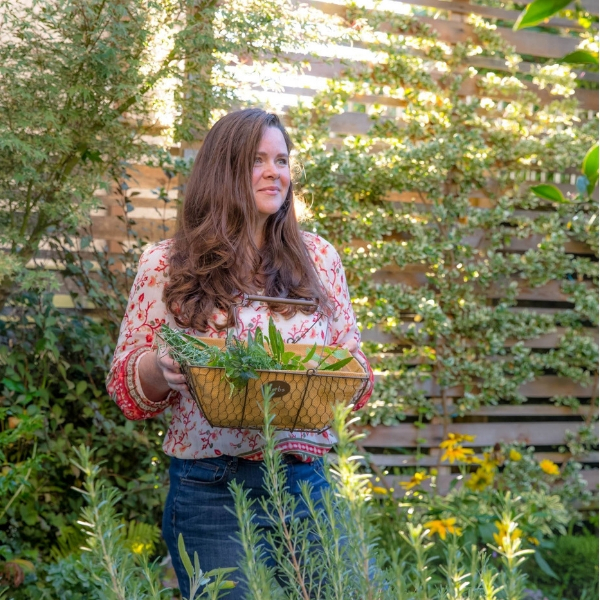 Test out flower petals and leaves that you have available, or use some of these tried-and-true varieties. Note: lavender and rose flowers would be an obvious choice if they held their colors well. Unfortunately, both quickly turn brown in oil applications and don’t look that attractive. 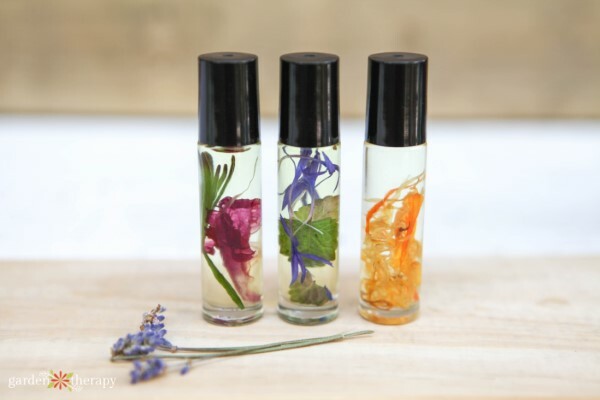 Spend some time blending essential oils to come up with a fragrance that works for you. 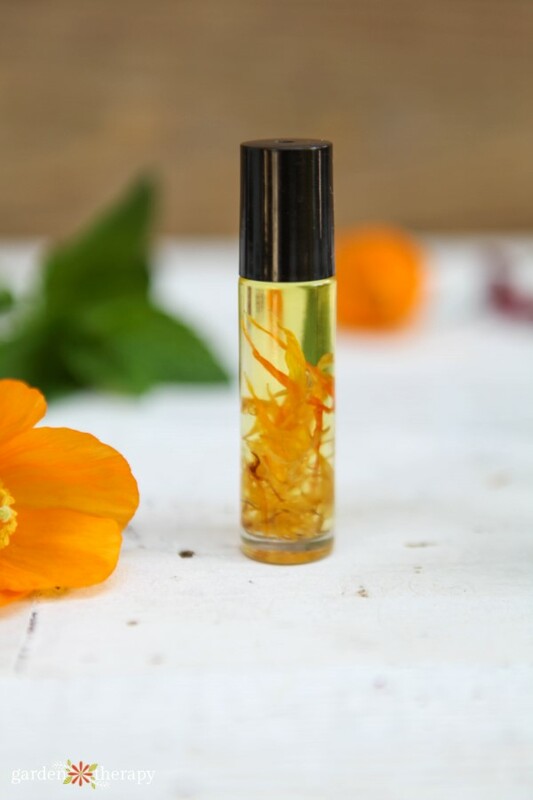 Collect fresh or dried petals and leaves to use in the bottles. Prepare the roller bottle by removing the lid and roller ball. 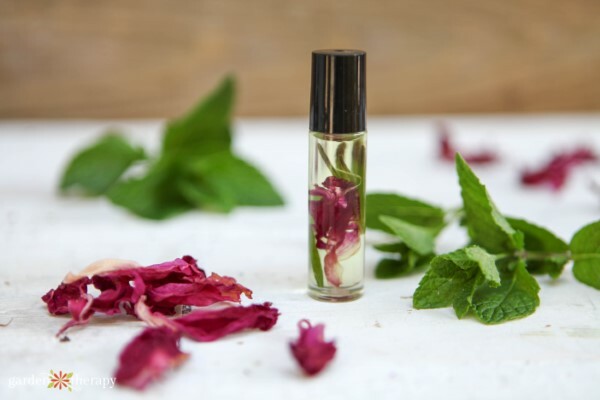 Fill your perfume bottle with carrier oil. Choose fractionated coconut oil if you don’t want your perfume bottle to have any color. The other oils will be in various shades of amber and green (grapeseed oil is shown here). Add 10 drops of essential oils per 10 ml bottle. 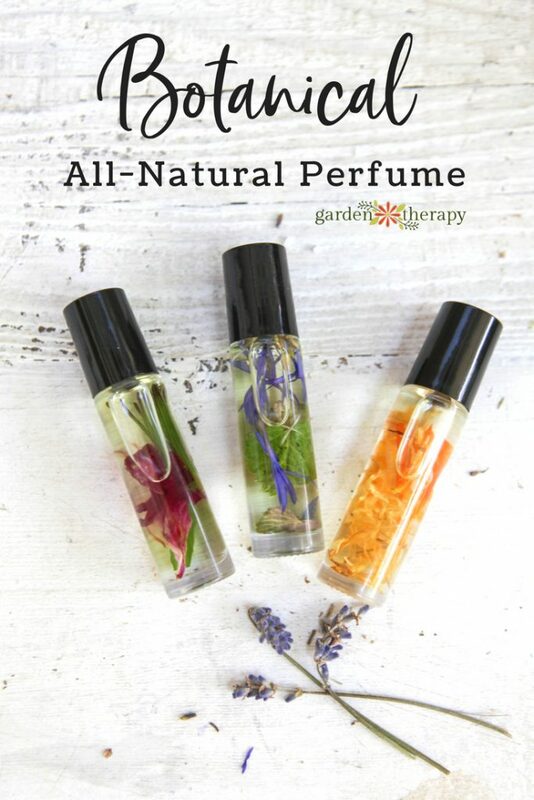 With the strongest scented oils, start with only one drop and move up if it’s not strong enough. There are some scents—like lemongrass and cinnamon—that are so strong that they can take over the entire blend. 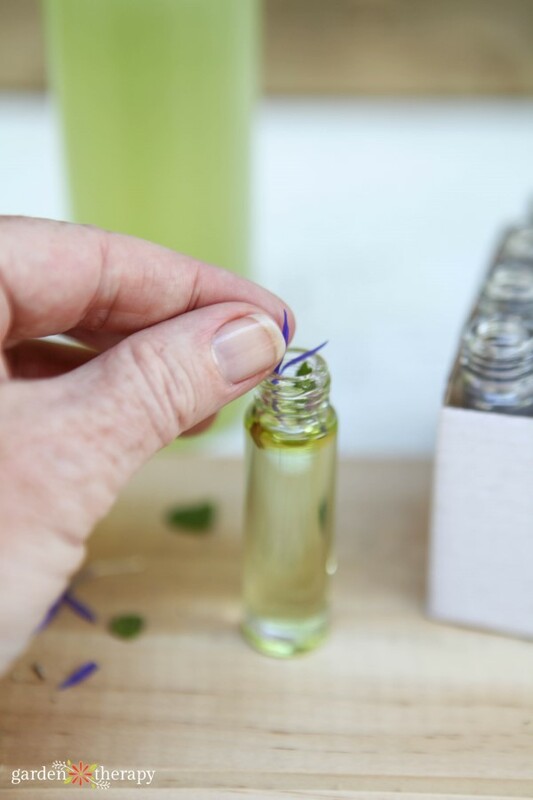 Add a combination of fresh and dried flowers, leaves, or petals into the oil to decorate the bottle. Pop the roller ball lid onto the glass vial. Shake well to combine the oils. Leave the blend for 24-48 hours to develop. As the oils work together, the scent will change. You may even be surprised at how different it is! 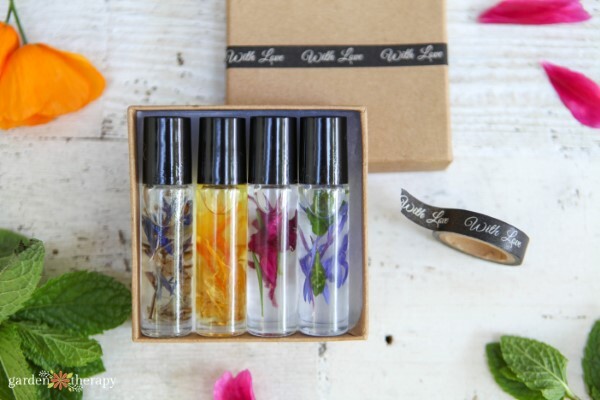 Package up a collection of four different scents in a craft paper jewelry box. Use washi tape with a message (I used some that says “With Love”) to create a band on the box lid.